Ria's RoadKill Jerky has stepped up a notch on the Scoville Scale with this new Habanero offering. 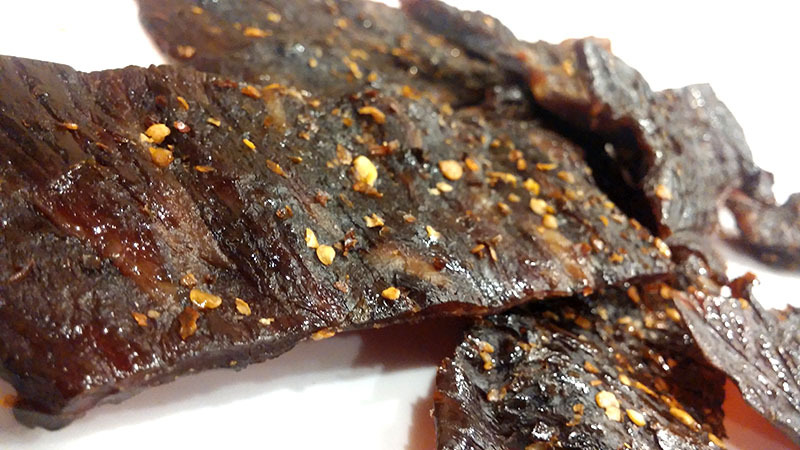 See our reviews of other flavors from Ria's RoadKill Jerky. 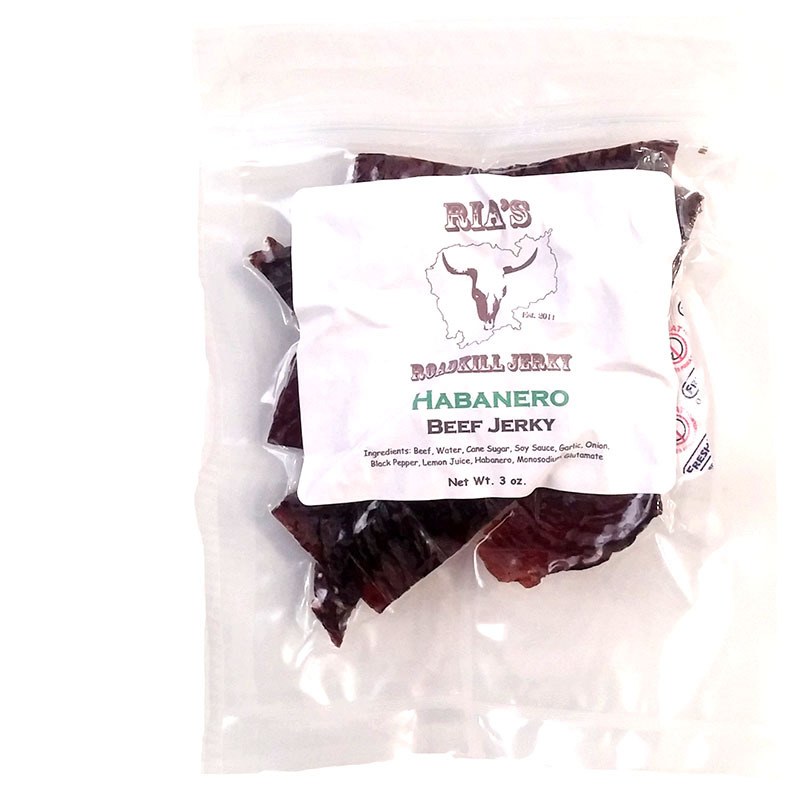 The company doesn't describe this jerky in any further way other than the name, "Habanero", but then again it perhaps doesn't need anymore explanation than that. The first thing I taste from the surface of these pieces is a sweetness, followed by a spicy heat. A real wood smokiness comes on soon after. The chewing brings on the natural meat flavors mixed with a bit more sweet. For being labeled, "Habanero", it seems to hold up. I pick up a good deal of heat, ranking as "hot" (level 5 out of 5) on my personal heat scale. I taste some of the habanero flavor too, more in the background. Otherwise, the habanero is reflected as more heat than flavor. But for chile pepper purists, there's more benefits to be had because I'm picking up a fair amount of endorphin rush too. Otherwise, the primary taste profile is the classic flavor that Ria's Roadkill is known for, the real wood smoked flavor, with a moderate sweet, a light savory blend of soy sauce and simple seasonings, and of course, the goodness of natural beef. The habanero is more of coloring of piquancy with its over-the-top fiery burn. The meat consistency is excellent. It starts out chewy and some pieces a little tough, but feels semi-moist and flexible. Once chewed down, it's feels like a eating pieces of steak cooked medium. Some pieces have flecks of fat, and some pieces will require more chewing than usual, but that real wood smoked flavor keeps me enjoying those chews. 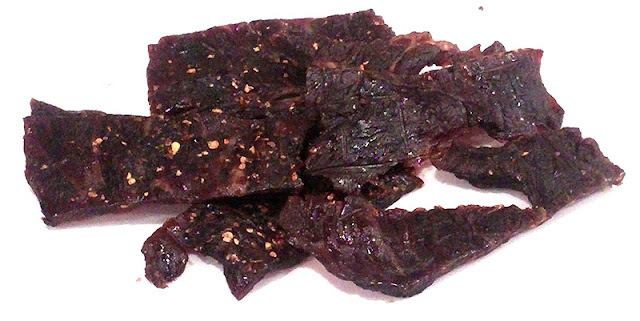 This Habanero beef jerky from Ria's Roadkill offers a great one-two punch of excellent old fashioned, wood-smoked jerky with the fiery heat of habanero peppers. I like that Ria's puts in the full heat of habaneros in this and doesn't try to water it down for the masses. It even gives off an excellent endorphin rush too. The habanero flavor is lacking a bit, but still manages to make a light showing against Ria's signature blend of simple, sweet seasonings. 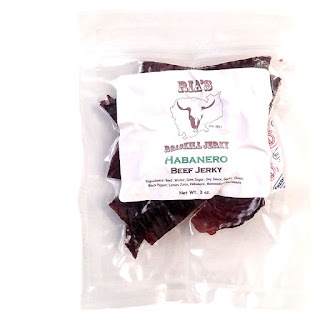 All in all, you take an already excellent, old-school jerky, and pack in a fierce habanero attack, and what you get is a jerky that chile-pepper freaks will love.